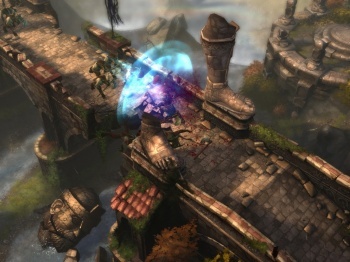 New Diablo III owners can now get past the game's first level but remain restricted in numerous other ways. There was a bit of a ruckus last week when Blizzard released the 1.0.3 patch for Diablo III, which in what the company claimed was an effort to combat credit card fraud saw people who purchased the game digitally restricted to level 13 and the first act for up to 72 hours. That's three full days of not being able to move beyond the "Starter Edition" - which is to say, demo - content. The good news is that with the release of the 1.0.3a patch, level and content restrictions for "unverified digital purchasers" is now removed. The bad news is that all other restrictions remain in place: no access to public games, no auction house, no trading, no chatting in public or game channels, no customized messages with friend requests and no Global Play until their payment information is verified. "Again, we want to be perfectly clear that these are temporary restrictions (often lifted within a day and at most 72 hours) associated with digital purchases for the protection of players," Blizzard wrote. "We appreciate player feedback and will continue to evaluate the best methods for ensuring a positive game experience for everyone." It's not perfect, but it's definitely an improvement. Not being able to chat or trade may be occasionally frustrating, but being unable to access content beyond what I would assume to be a very easy-to-achieve level 13 (I haven't played Diablo III but if it's anything like the previous games, you should be able to hit that level before breakfast), particularly for those just doing the single-player thing, is absolutely inexcusable.